This past week was less than typical but so, so much fun. On Monday Ryan and Curtis left for scout camp and where gone until Saturday morning. They came back with lots of fun stories and seemed to have a great time. On Thursday morning my teenagers left for a Youth Conference Trek and where gone until Saturday evening. Again it sounds like they had a great time and I have been enjoying their fun storied too! But that left Charly and I home by ourselves for a little bit of time. That does NOT happen very often and when it does it is just for a few hours not a few days. Can I just tell you we had a lovely time. I had her make a list of all the things that she would like to do during that time. We then planned when we would do them. You should have seen Charly just light up as we were planning and doing these simple little things. Go to Grandma's and sew skirts for us and her favorite stuffed animal. Watch a Raw Family video on how to make green smoothies (I promise it was her idea...I didn't even hint about it. With all the fun we were having you may have noticed not much happened in the way of posting around here. But that's okay when I'm not busy posting I usually find more time to create in the kitchen that inevitably leads to more fun recipes. Charly and I spent one morning working on a new spiced pancake recipe that we think has a lot of potential. I'm thinking less posting with less need to have it perfect on my part may be in order here. You see it just takes me so long to put a post together that I'm finding more time seems to be spent trying to perfect a post and it's pictures then actually creating great recipes. So I'm going to relax a bit. And focus more on what I love. I think I kind of mentioned this in my last post. Don't worry I still plan to keep sharing favorite recipes I'm just thinking of doing it in a more relaxed easygoing kind of way. Although last week was fabulous it's so nice to have the family all back together....everything is just right with the world when we are all together. Veggie Stir Fry with Garlic Sauce - Sorry I don't yet have a recipe for this. I have one in my head that I'm going to try out tonight if it's good I of course will share. Smothered Chimmichungas - I'm going to just pan fry these in a little coconut oil instead of turning on the oven and heating up the house to bake them. Mediterranean Chickpea Salad - of course I will adjust it a bit but it looks like a fun salad to try. 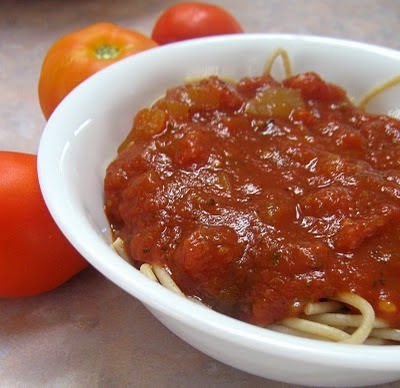 Spaghetti - Okay I know this isn't a sandwich.....but my Sister is bringing some of her homemade sauce and well we have a little change of plans.